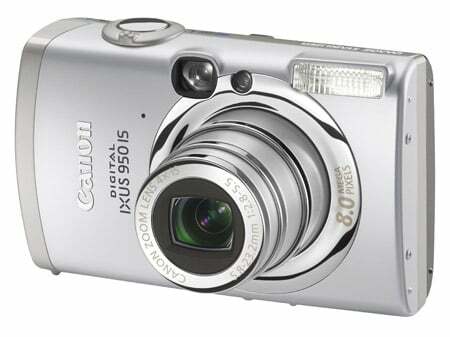 Review The new Ixus 950 IS from Canon is an example of a quality, eight-megapixel compact digital camera comfortably sitting at the top end of the mid-range. Known as the SD850 IS across the Pond, it features a 4x zoom lens, with 2.5in LCD display, red-eye correction and a sensitivity of 1600 ISO with auto ISO shift. Despite being just a little bit chunkier - and heavier - than most other compacts in the same class, it still measures a pocket-sized 9.0 x 5.7 x 2.6cm and weighs in at 165g. The Ixus 950 IS feels solid, sturdy and well-made, despite giving the fragile first impression typical of many shiny, semi-expensive gadgets like compact digital cameras. Every element of Ixus' casing is kitted out with stylish curved lines and the whole thing is constructed from an aluminium composite with an attractive three-tone metal finish. Filthy fingerprints don't really stick to this shiny surface, except on the LCD, of course, so it's quite easy to keep clean. Only the AV output/USB port has a clip-close plastic cover. Like almost every compact digital camera of this class, it features a textured thumb grip on the back that helps the device to be firmly held. The LCD monitor comes with a 2.5in, 30,000-pixel resolution display - twice the resolution of the Pentax Optio M30, reviewd here - and is big and bright, adjustable to one of 15 different brightness levels. Most importantly, it has a non-reflective coating that makes shooting in bright sunlight considerably less painful than with other compact cameras currently available. Honestly, this simple feature can make such a difference if you're remotely serious about photography. If the sun's high and bright in the sky or simply reflecting off snow-covered slopes, the ability to actually see the LCD monitor can be critical in framing a shot.